How are you doing these days? Are you also counting down to the first Spring days? I am! But still we’re in the midst of winter and it sometimes feels like there’s coming no end to it. These dark and long days effects us both mentally and physically. However, there are some things we can do to uplift our days and that will benefit our health. So here are some ideas from my daily life. I hope you’ll find them useful too! Bring nature into your home. It’s an effective way to help you feel connected to the natural rhythms of your day. Its presence encourages your body to adjust to the ever-changing outside world. 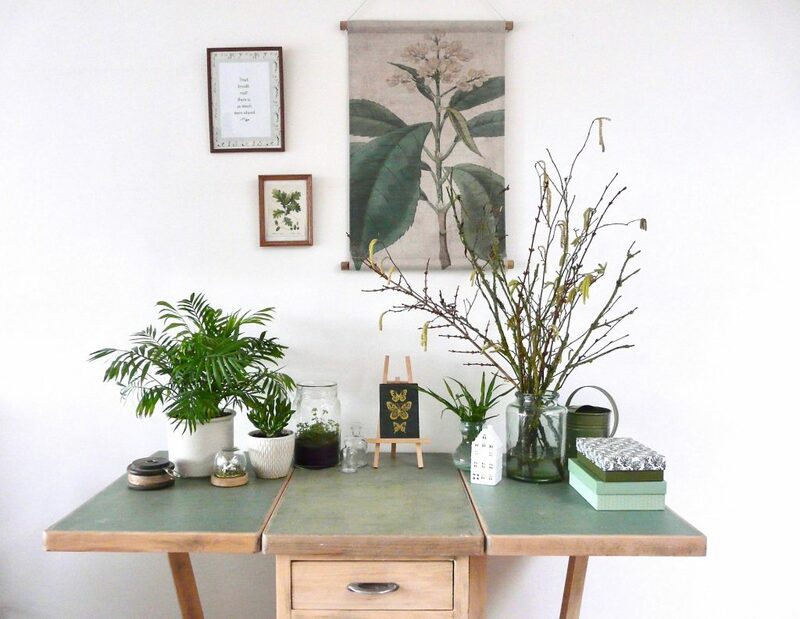 Research has shown bringing nature into your home will support your wellbeing. Surrounding ourselves with direct or indirect elements of nature can alleviate stress and lower our blood pressure while also encouraging creativity and productivity. And that’s what we sometimes need on a grey day, isn’t it?! 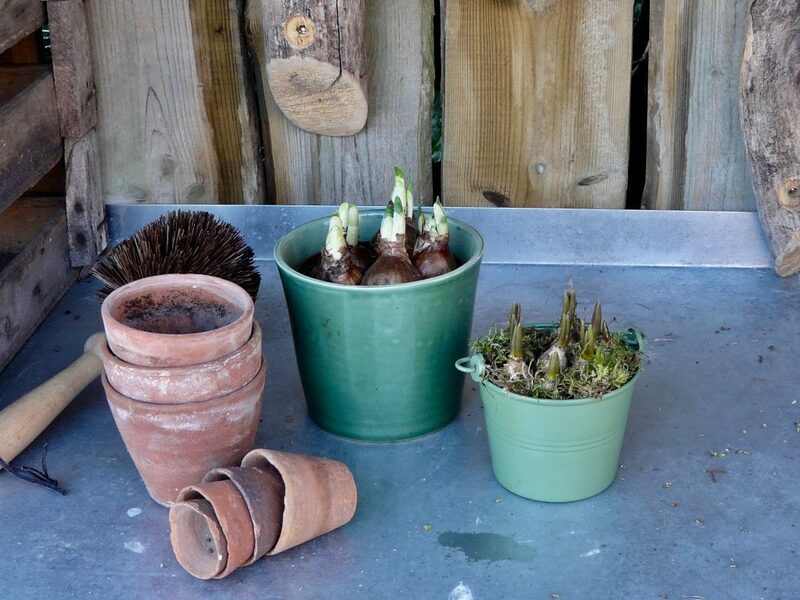 Planting bulbs and getting your hands dirty in soil is therapeutic, grounding and rewarding. At the market in the weekend, I bought some bulbs of magic blue muscari and white double narcissus. It will be a delight to watch them growing. 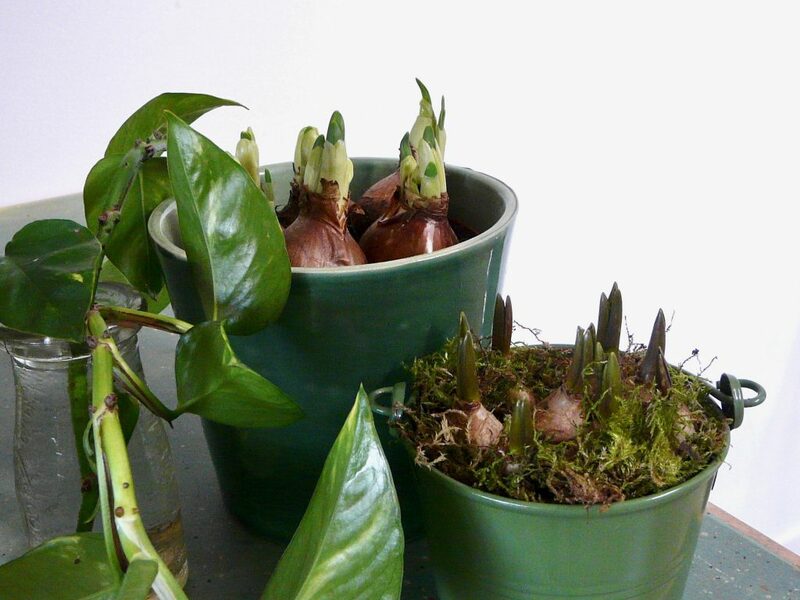 You can for example also buy some fresh hyacinths to scent your home. Admire their beauty and enjoy their sweet aroma. And maybe you can make cuttings of some of your indoor plants. 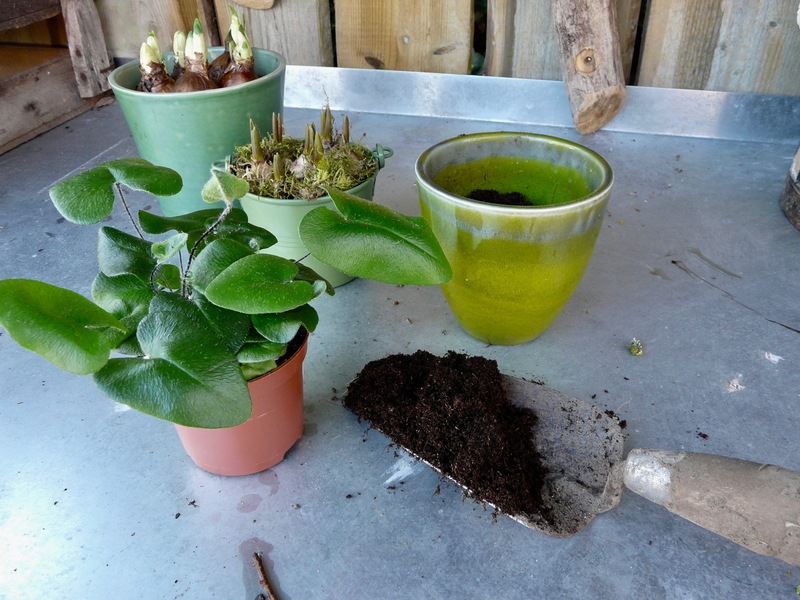 I have a fast growing epipremnum aureus and made 2 cuttings. Choose a stem with at least 2- 4 good leaves. 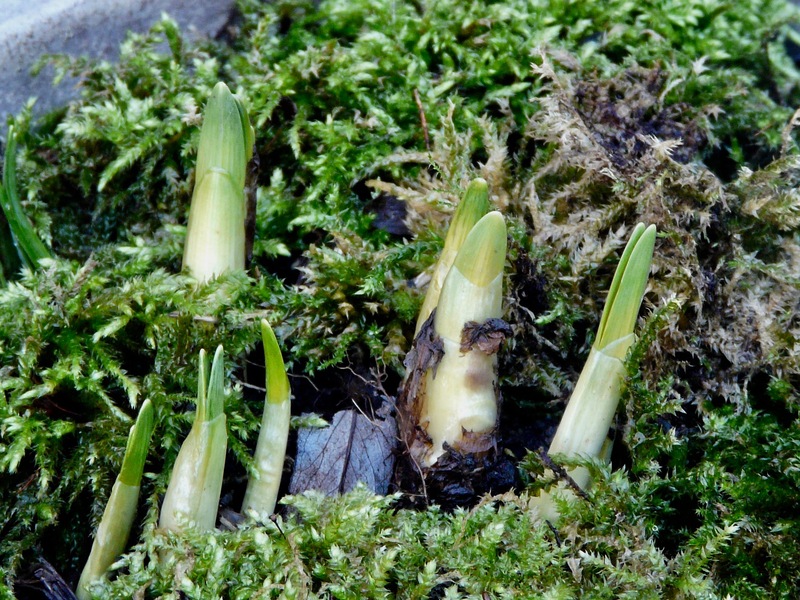 Cut off the shoot with a clean, sharp knife, approximately 2 cm under the place where the leaf grows out of the stem. 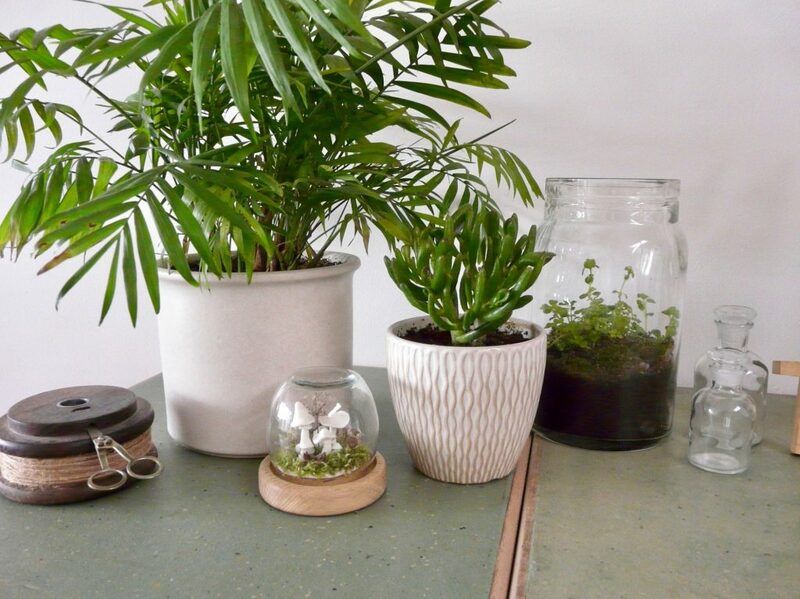 Put into a jar with water and after 2 weeks you’ll have a baby epipremnum! “Bulbs need so little and give back so much. Gardening in winter reminds us of the beauty found in nature even when everything is stripped back and bare. Plants and trees also show us that this is a time for resting, drawing inwards and nurturing ourselves. Although gardening is usually associated with outdoor spaces, you can experience many of the same health benefits while gardening indoors. For example, spending a few minutes each day watering and tending to plants, or replanting a new indoor plant, will provide you with moments of calm. To get our daily portion of vitamin D, we have to go outside. So wrap up warm and embrace the great outdoors. Walking in a green space has a direct positive effect on several systems in our bodies. For example the blood pressure decreases, the levels of the stress hormone cortisol drop and anxiety is alleviated. When we walk, endorphins are released in the bloodstream and induce a mild euphoria. Look for signs of spring and maybe you can spot some birds. This morning when I was running I saw for the first time in my life a fox in wild nature. I didn’t know he was so big, gently crossing my path and disappearing in the woods. I was still and astonished for some minutes, it felt so unreal. 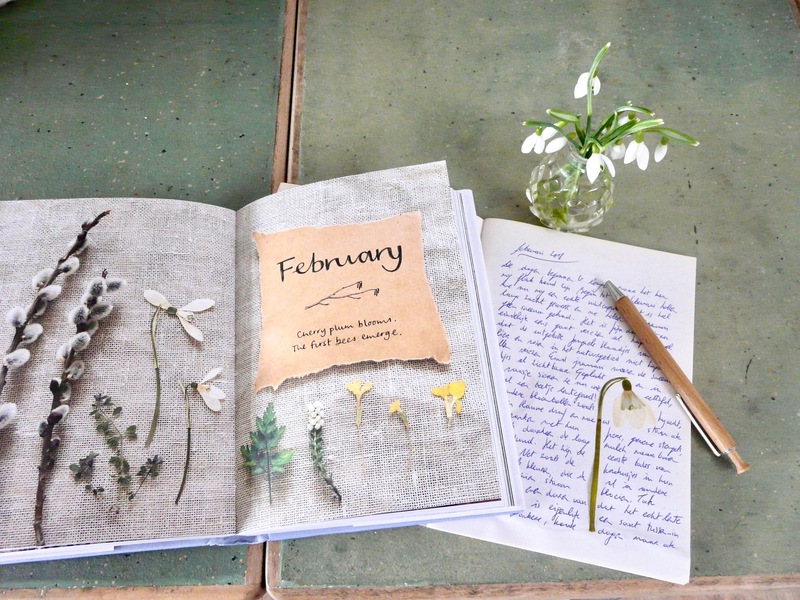 Collect some plants and flowers to dry and make a nature diary. It’s a calm and creative activity that will soothe our minds. Take the time to read and relax on wintry evenings. Just curl up on your sofa and get lost in a beautiful story or poetry. This is our reading spot for this winter. We have bought a “new” (secondhand) relaxing chair with heating plates inside. 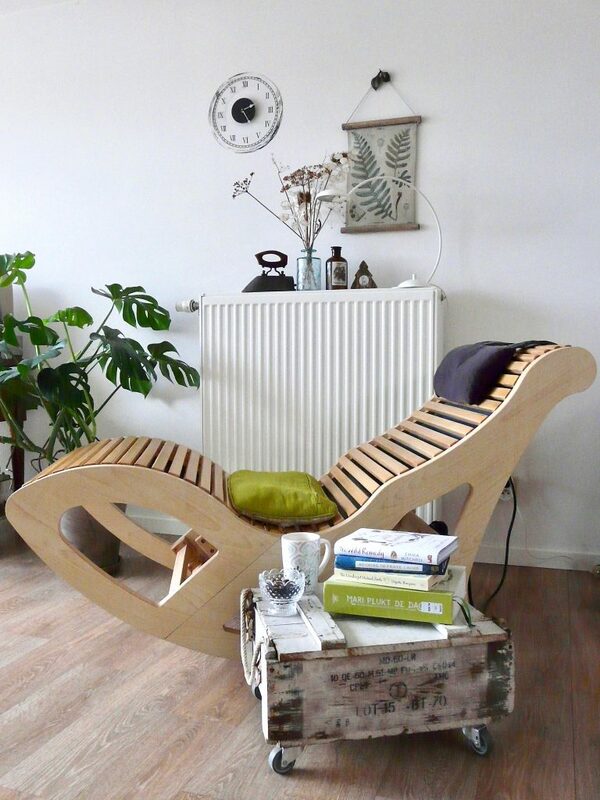 In the evenings I love to curl up in this chair with a good book and my cup of evening tea. The warmth relaxes my body and makes me ready for a good night sleep. Maybe you can take a warm relaxing bath, surrounded by candlelight and enjoy the beneficial warmth. Add some drops of essential oil such as lavender or rose to make it a feast for all the senses. Light the candles when it gets dark and enjoy the glow and warmth it gives the room. This is a luxury we can only enjoy in the dark evenings of winter. Some of the books I’m reading at the moment: The wonderful weekend book by Elspeth Thompson, The wild remedy by Emma Mitchell, Wreaths by Terri Chandler and Katie Smyth. 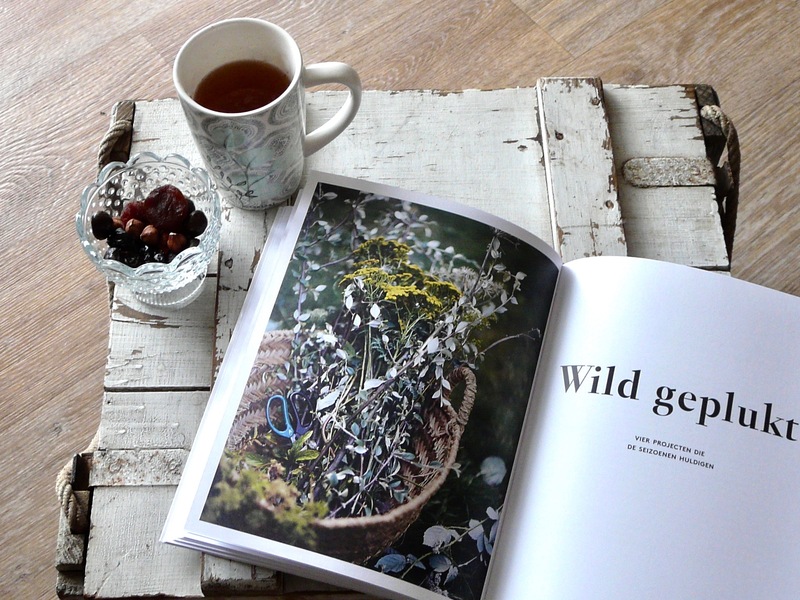 And the wonderful book “Mari plukt de dag” (in Dutch) with 607 recipes in the 4 seasons and 1001 tips for gardening by Mari Maris. Books are food for the mind, but what about food for our bodies? It’s the season for blood oranges with their warm and happy colors! They contain vitamin C, which gives a boost to your immune system and vitality. 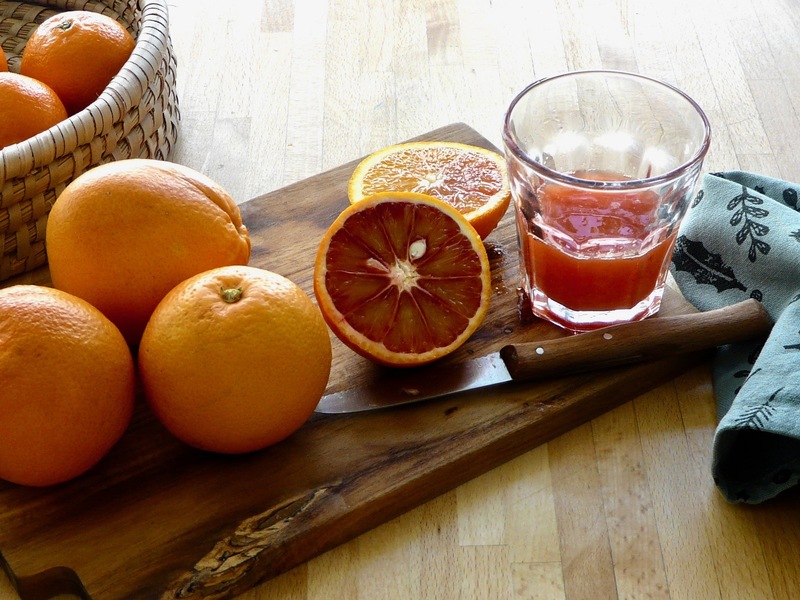 A little glass of fresh juice in the morning will add color to your breakfast and vitamins to your body! The last activity I would like to add is writing letters or cards. 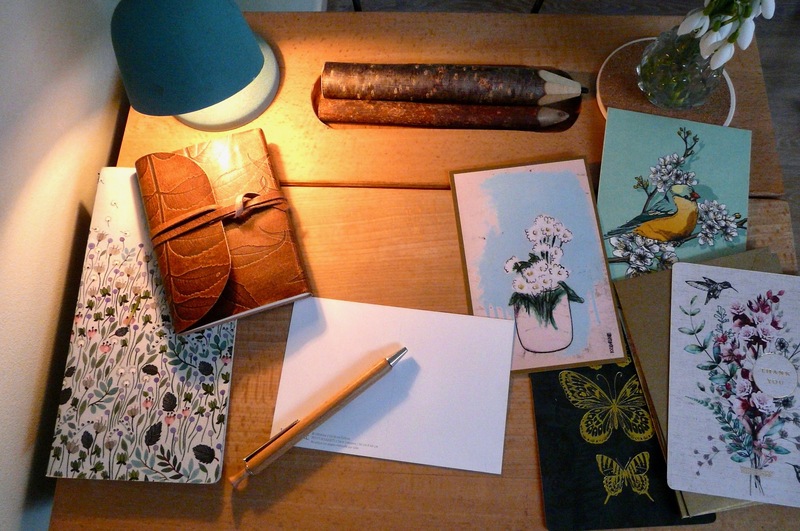 It might seem old-fashioned in this digital age, but there’s something heartwarming in writing to someone else. The pleasure of sitting down and writing to a friend, and the excitement of a handwritten envelope arriving in the letterbox. Of course, the instant communication of texts and e-mail has its uses and is often very practical, but they can’t compare with the tactile delights of a real letter or a beautiful card. I mostly write cards and whenever I see a beautiful card, I buy it and add it to my card box. When there’s someone I want to write to, I always have a big selection to choose from. I thought it would be a nice idea to bring this into practice by writing a card or letter to someone. I would like to invite you for a little “real writing experience”. You’ll get the chance to write a lovely card to someone you don’t know, probably from another country. 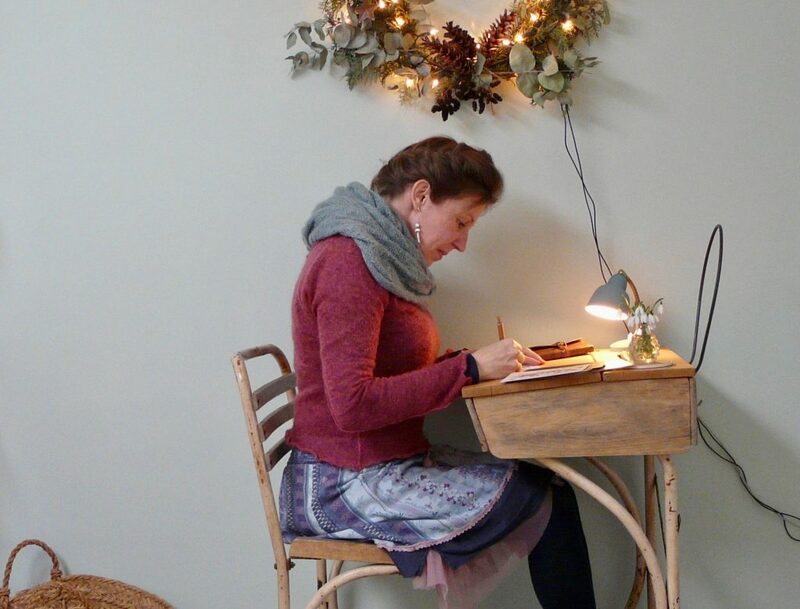 And of course that someone will write you a beautiful card or letter too! If you would like to join this kind of letter/card swap, you can send me an e-mail with your post address before the 20th of February. And on Friday, the 22th of February, I will send you an e-mail with the address of the one you’ll have to send a card or letter to. (Your e-mail and address will removed from my mailbox after the 22th of February, so it won’t be used for anything else.) If it’s not completely clear to you or you have a question, feel free to send me an e-mail! I’m really hoping many of you will join this wintry activity and make someone (and yourself) happy!